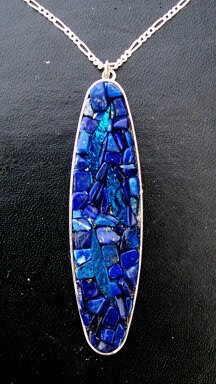 Margo Anton's Mosaic a Day: "Lapis Pendant"
The photo of this particular pendant is not as good as it could be. You can't really see the dichroic glass in it. The effect of the dichro is kind of neat in this one, as it is a similar color to the lapis, but then flashes to turquoise from a side view. In hindsight, a different color might have been more effective, but I was going for tone on tone, so I certainly achieved that!